Convention Centers and Resort Hotels in Greece have assisted in the development of congress tourism in our country, a priority involving all competent agencies, professional organizers, hoteliers, unions and the state. With the major infrastructure projects that have been completed for the absolutely successful organization of major international sport, cultural and business events, the increase in the numbers of convention centers and resort hotels with independent conference facilities, Greece is daily improving its infrastructure and is prepared to meet the needs of any type of congresses and events. With outstanding convention centers, many of which are located near or on the grounds of luxury resort hotels in Athens, Thessaloniki, Rhodes, Crete, Kos, Chalkidiki, Volos, Metsovo, Alexandroupolis and Patra, Greece offers plenty of opportunities and completely meets all the requirements for the organization of all types of congresses. Most of the regions in Greece, with their multilateral historical and cultural heritage, natural beauty, modern convention centers and resort hotels with conference facilities, constitute a comparative advantage of choice for the organization of your next convention or any type of cultural, recreational, professional event, since they offer you a complete comparative advantages in comparison to other, remote international destinations. 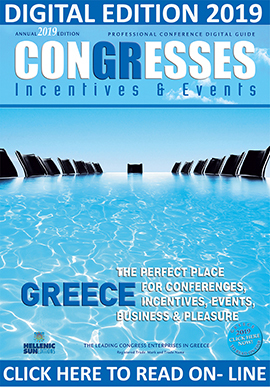 Greece, with its modern CONVENTION CENTERS, luxury resort hotels with conference facilities and experienced congress organizers (P.C.Os) & D.M.C., invites you to organize your next congress or event with complete safety, guaranteeing its success.